My name is Juan Mora. I was honored and excited to attend NOGLSTP’s Out to Innovate conference held at the University of Southern California (USC) March 15-17, 2019. It was an eye-opening experience to be a part of this amazing conference. Although I believe Sul Ross State University (SRSU) staff has done a wonderful job making our campus LGBTQ+ friendly and accepting, through a panel I attended, I realized we could be doing more. I had the opportunity to talk to several graduate professionals who have made a career in a STEM field. Talking with these professionals I learned many academic communities are incorporating a diversity and integration statement in their syllabi. I think SRSU could add a diversity and integration statement to our syllabi. This could allow for students and professors relationships to grow stronger in that the students will be more comfortable in approaching professors for help and guidance. The panel of professors explained that some of them are straight forward in coming out to their students. They feel this approach ensures students that their classroom is a safe space and no form of discrimination will be tolerated. Other professors explained they gradually let their students know slowly or throughout the semester that they are gay, lesbian, or transgender. All professors said they acknowledge the pronouns they prefer as professionals. A central topic was the idea that personal and professional life should be separate. Many of the professionals in STEM that are part of the LGBTQ+ community said they feel their jobs are not just jobs but their passion. They said they are completely open about their sexuality, but ensure they do not cross the line of over sharing. A concern that came up during the panel discussion was if they are openly gay, did they feel or have they seen discrimination such as being passed over for a promotion or not being considered for tenure for being openly gay. Their responses were that they had not noticed any discrimination based on their own experiences. However, even though it hasn’t happened to them they have heard stories from other colleagues from other schools or agencies. Ultimately, the panel suggested approaching situations at your comfort level and don’t let other students or co-workers undermine you because of your sexual orientation. Within the federal government, it was thoroughly explained that no one cares about your sexual orientation. The panelists said that many agencies don’t care about sexual orientation; what they do care about is your work ethic and if you will contribute to the program. There was one panelist who explained that he went from one major change in a job to another every few years to stay close to the family. Then about 5 years ago she joined the federal government as a transgender female. She doesn’t feel intimidated in her work place and oversees a large staff working on federal science policy. At the One USC archive, we were given the opportunity to learn about the history of ONE magazine and what the PRIDE parade was originally about. The PRIDE parade came about as a protest against gay clubs being raided by cops. As a stance the gay community came together and started to fight back when they got raided. 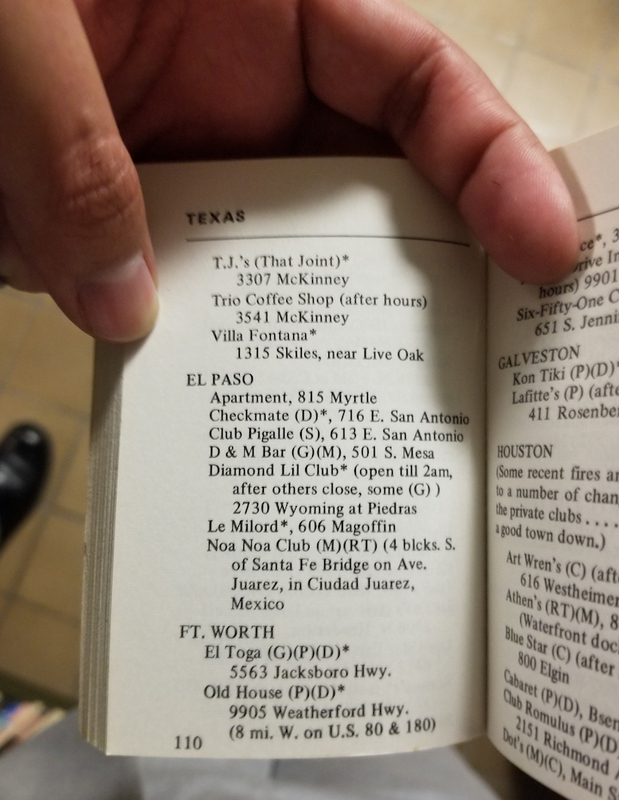 One man made a pocket-sized guide of hotels, clubs, and restaurants that were gay friendly and would distribute them to allow others to know where it would be “safe” to meet. We were able to see literature that was written by many of the LGBTQ+ community members from the 1950’s, and 1960’s called pulp fiction. This allowed people to express their sexuality in a safe way and allowed others to imagine the “naughtiness” of it. At the final dinner we were able to meet Randy Driscoll, who wrote the song for Matthew Sheperd called “What Matters.” She explained that the song isn’t necessarily about him but more about loving people for who they are and accepting everyone as themselves. It is a beautiful song that moved everyone to tears! Before that night I had no idea who Sheperd was and why he was such a significant symbol for the LGBTQ+ community. Briefly, Matthew Sheperd was a college student at the University of Wyoming who was bullied, beaten, and killed on the night of October 6, 1998 because he was an openly gay man. He was rushed to Poudre Valley Hospital where he died six days later from severe head injuries. Many people were outraged and wanted to help his family, so they would send money not knowing what else they could do. Matthew’s mother decided to start the Matthew Sheperd Foundation. The Matthew Shepard Foundation’s mission is to empower individuals to embrace human dignity and diversity through outreach, advocacy and resource programs. They strive to replace hate with understanding, compassion, and acceptance. The NOGLSTP’s Out to Innovate not only educated me about STEM fields and informed me of the many opportunities that are available to us as members of the LGBTQ+ community but also showed me a brief history that has allowed me as an openly gay man to live comfortably, openly, and vibrantly. In April 2018, the Diversity and Inclusion Committee endorsed and submitted the following “Report on Diversity and Inclusion–An Inquiry into its Importance in Higher Education, its Status at Sul Ross State University, and Recommended Strategies for Achieving Institutional Success,” by Dr. Savannah L. Williamson. As of the date of this post, the report has been distributed to members of the University Executive Committee. The Diversity and Inclusion Committee is waiting to be put on the E.C. agenda to discuss the Report and its recommendations. A Human Library is designed to build a positive framework for conversations that can challenge stereotypes and prejudices through dialogue. At Across the Spectrum, Sul Ross students placed became “Human Books” who told their stories and provided information about the LGBTQ+ community to nearly 100 people, from both the university and the surrounding region. SAGA members also decorated colorful posters and placed trivia facts around the room to highlight different identities across gender and sexuality spectrums. Those in attendance also had the opportunity to ask questions about the LGBTQ+ community in an open and judgment-free space. The evening, however, was more than just an educational one as SAGA raised over $225 in donations for The Trevor Project, a non-profit organization that works to prevent LGBTQ+ teen suicide. Across the Spectrum is also one of several events organized by the Sexuality and Gender Alliance in observance of LGBT History Month in October. For National Coming Out Day on October 11th, SAGA posted a colorfully decorated closet door, framed by a 300-balloon rainbow arch, outside of the University Center for Sul Ross students to metaphorically “come out of the closet” as members and allies of the LGBTQ+ Community on campus. On Monday, October 29th, SAGA will host a Halloween Movie Night by showing Rocky Horror Picture Show and hosting a costume contest. SAGA students set up a rainbow balloon arch and a closet door for National Coming Out Day, Thursday, October 11, 2018. The students of SAGA say that they plan to continue their work on and off campus to increase visibility, awareness, and acceptance for our LGBTQ+ population. In the month of November, the group will be reaching out to local businesses to create a Yellow Book—a list of local businesses and establishments that do not discriminate—to ensure that the campus and local LGBTQ+ community is included and safe in Alpine, Texas. This comes at an important time, as the Trump Administration has announced its intent to add a caveat to the non-discrimination policies of The Office of Management and Budget and the Office of Federal Contract Compliance Programs (OFCCP) next month. The new rules would allow for-profit businesses and federal contractors to discriminate against employees and customers based on their sexual orientation, gender identity, and gender expression, with additional implications for intersex communities. 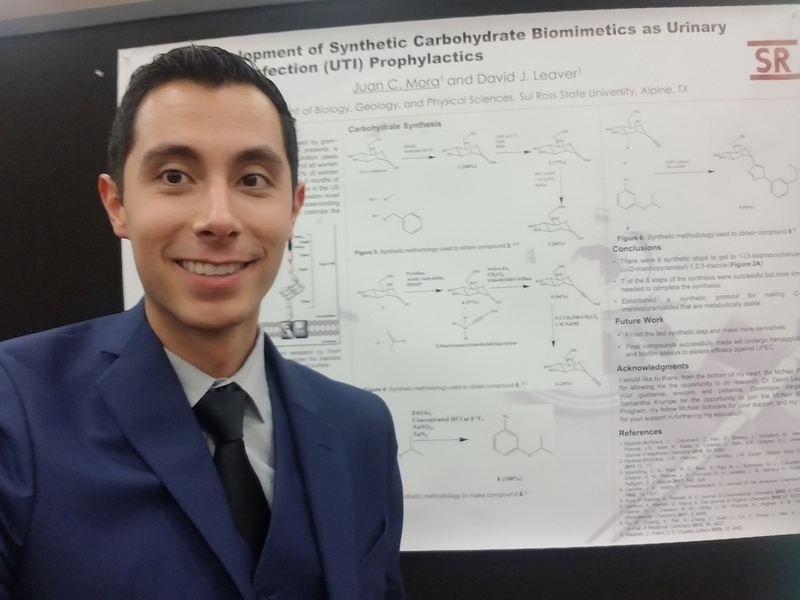 Eight McNair Scholars and one faculty mentor attended the 2018 SACNAS National Diversity in STEM Conference in San Antonio, Texas. From Left to Right: Yelixza Avila, Olivia Enriquez, Dominic Carrillo, Juan Mora, Kaylee Plowman, Anissa Garcia, Itzel Soto, Noheli Gutierrez, Dr. Alicia Trotman. SACNAS is an organization that promotes diversity in STEM disciplines. Their annual conference is a place of openness, in which every person is welcome to be exactly who they are. From recognition of National Coming Out Day on Thursday, October 11 to two days of student research presentations to the Native American Pow Wow on Friday, October 12 to the Pachanga! on Satuday, October 13 – all were welcome at the 2018 SACNAS National Diversity in STEM Conference. The Sul Ross McNair Scholars Program sent eight scholars and one faculty mentor to this year’s Diversity in STEM Conference. When the students returned from the conference this Sunday, October 14, they were asked to reflect on their experience. Next year’s SACNAS National Diversity in STEM Conference will be October 31 – November 2, 2019 in Honolulu, Hawaii. Committee shall consist of a no more than nine (9) members and up to four ex officio members, for a maximum of thirteen (13) members on the committee. Membership shall include three (3) representatives from the faculty, with one representative from each college; two (2) representatives from the staff; one (1) athletic program representative; one (1) student representative; one (1) community representative; and one (1) member to be appointed by the University President. The ex officio members should represent the following areas: Assistant Director of Residential Living, Director of Counseling and Accessibility Services, Title IX Coordinator, and the Dean of Student Life. TERM: Two-year tenure for faculty and two-year staff appointments, with up to two-year appointments for the student representative(s), and a one-year appointment for the community representative. Initial memberships will be staggered two-year or three-year terms. • Nominated by voting members of the committee.